Tucked away in a quiet strip mall, nothing is more odd than finding this precious gem in such a banal location. Baumé, a 2 star Michelin restaurant, provides an exceptional gastronomy experience that even the most jaded foodie would give it a nod of approval. Who would have thought that Palo Alto would be a great place to have a delectable meal? Well, Baumé is such a place. I would say the plating reminds me a lot of Japanese design; very clean, precise, and minimal. The food, while not exceptionally experimental (like Atelier Crenn), it is extremely kind to your palette. Baumé provides a set menu. Major ingredients of every single dish are listed in writing and they ask you if you are allergic to anything. After that, the waiters glide away and your meal commence. The bread is, perhaps, the best restaurant bread ever; the texture is airy, moist, and yet silky. Yes silky! I don't know how to describe it besides using the word silky. I know it's an odd description for bread but you just have to taste it and I'm sure you'll agree with me that it's silky in texture. They have one gimmicky element that are quite fun... the compressed napkins. It was fun to see them grow! LOL. My favorite dish of the night is probably the lobster risotto dish. Too often lobsters are overcook and become rubbery in texture. Well, not the ones at Baumé; perfectly seasoned, the lobster I had was sweet and plume. Another stand out was the pork dish. Daikon made to look like scallop which balanced with sour spring roll and salty braised pork; a perfect combination of sour, salt, and sweet. Service, of course, is exceptional (unlike Mélisse restaurant in Los Angeles which has the worst 2 star Michelin restaurant service I have ever experienced). There appears to be three waiters in our part of the room that covered 7 tables. They did an exceptional job orchestrating delivery of food, drinks, etc.. I would highly recommend anyone going there for dinner. 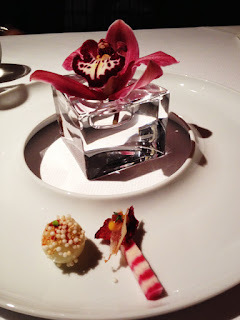 The experience was exceptional and I am more than happy to go back for another fantastic meal.